The Free Curricula Centre is a community of research and practice founded in 2003 with the goal of reducing the cost of textbooks and other curricular materials to zero through the use of open educational resources (OER). FCC is now housed at New World University, where it supports the university’s mission to provide quality, affordable higher education to individuals in economically developing countries. Since FCC first opened in 2003, many OER textbooks have been developed. As a result, the Centre currently has several ongoing projects that seek not to create new textbooks, but instead to add value to those that already exist. Through these projects, we seek to do for educational curricula what open source software has done for computing: focus cooperative efforts to bring about low cost, high quality alternatives to commercial products. Our OpenCourseWare initiative starts with existing OER textbooks produced by the community, adds playlists of videos and/or podcasts designed to accompany them, and includes discussion prompts and related materials to create complete courses. In our own use with textbooks, partners and students have asked for these sorts of multimedia enhancements to the OER textbooks we use in our programmes. The media playlists we develop can consist of original material, or material curated from that found on sites such as YouTube and Vimeo. 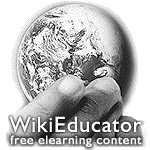 We are using the WikiEducator platform for development of these resources, although students should follow the completed courses found on the New World University web site. Our Mobile Textbooks initiative takes OER textbooks that are only available in PDF or Word format and converts them to EPUB format so that they can be readily used on mobile devices, including smartphones. Help us!